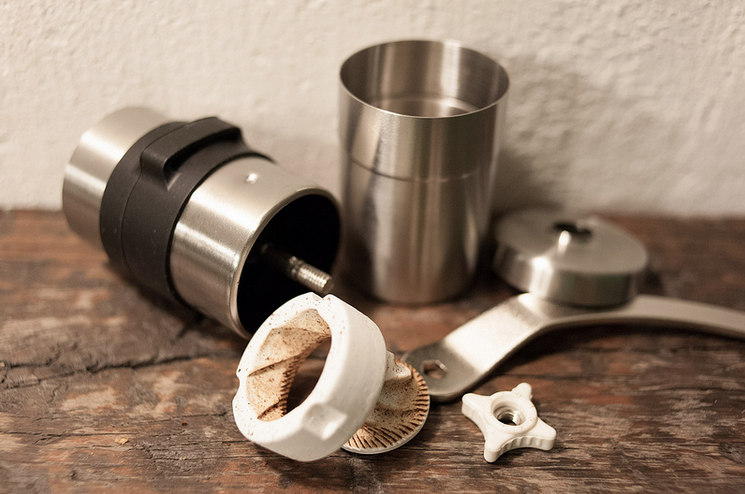 For the coffee connoisseur, you’ll want to have a manual coffee grinder that’s perfect for your Aeropress coffee maker. Here we’ll review the best coffee grinders for Aeropress. 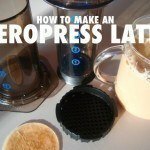 For those who don’t know Aeropress, they are a company that has created a beautifully simple coffee making device that avoids most (if not all) of the common problems you’ll find with electric coffee makers, resulting in some of the smooth-tasting coffee you’ve likely ever tried. 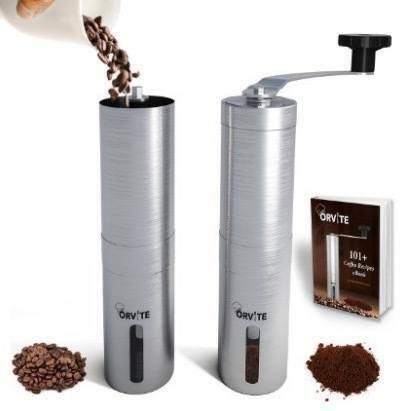 In order to make the best coffee possible, we always encourage people to get a good coffee grinder. And, it so happens, some of these are designed specifically to be used with an Aeropress coffee maker. So, if you believe in taking the time to grind your coffee for that perfect blend, you’ll be interested in reading our top picks for best coffee grinders for the Aeropress. Of course the selections here are going to be manual coffee bean grinders, because such grinders are generally designed to fit and grind right into the Aeropress itself. 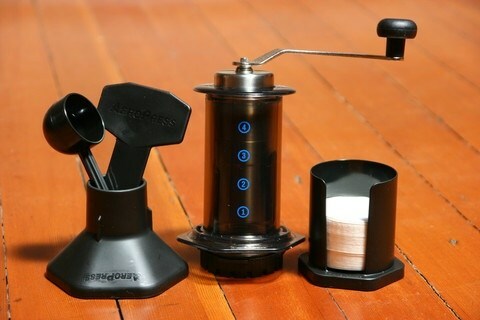 Here’s a quick look at our Top 4 best Aeropress coffee grinders! Let’s get started with a buyer’s guide first so you can know exactly you should look for! 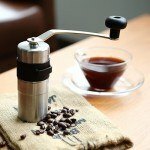 Finding the best grinder for Aeropress can be a bit difficult if you aren’t familiar with the features and factors you should be looking for. But if you take time to get yourself the right kind of coffee grinder, that works in conjunction with the Aeropress coffee maker, we can guarantee you that you will immediately see better results in your favorite’s coffee flavor, almost instantly. Grind range is also known as grind size and it’s usually important to get the right bean grind size for your wanted coffee type. 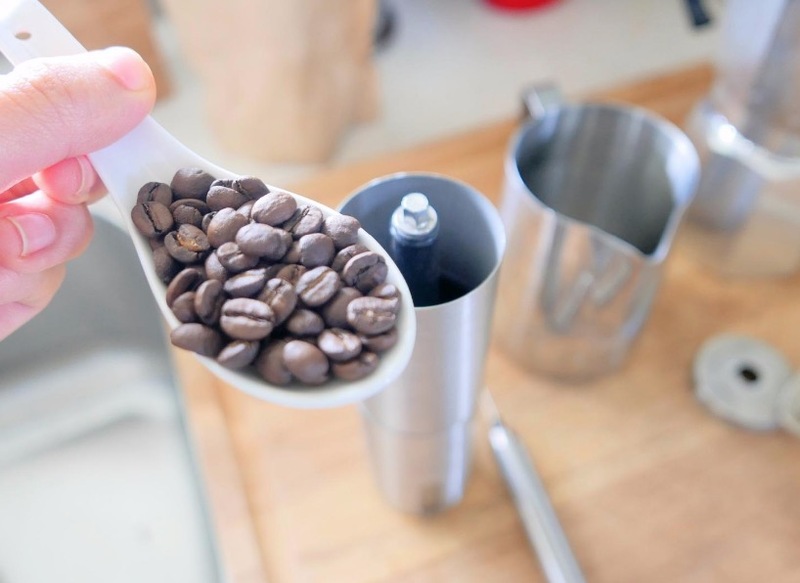 Most grinders can grind from powder to french press, which makes suitable beans grind for espresso or any other coffee type. 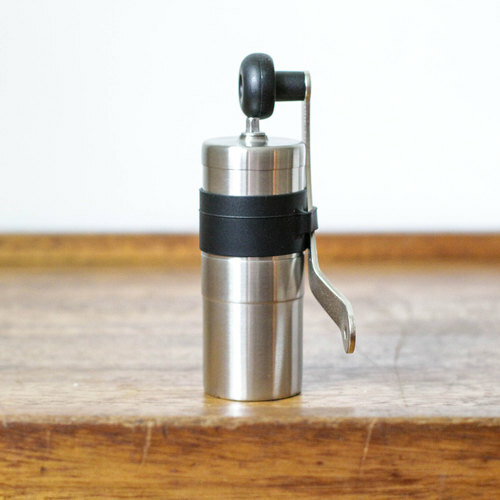 Some grinders, for example, the Baiyea Manual Coffee Grinder, has an adjustable grind size selector. It adjusts the grind size by turning the rotor clockwise in order to produce a better texture along with the desired size. If you’re going to grind coffee beans for different types of coffee, getting an adjustable grind size feature is really useful to have. Every grinder is different, and so is their bean hopper capacity. Most grinders come with about 20-gram capacity. Some grinder models come with more while some come with less capacity. While some people think the more is better, in this case, it’s not really that important. 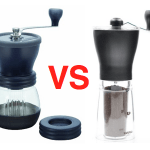 The types of manual grinders we’ll be looking at here generally hold less beans than their electric counterparts, but they make up for it in the fact that they pair nicely with the Aeropress coffee maker, in terms of grinding directly into it. Refilling the grinder will have to happen from time to time, and the time difference between different hopper capacities isn’t really that huge. Consider also that the Aeropress itself isn’t that big, making these smaller manual grinders a perfect match for it in both overall size and bean hopper capacity. For the best coffee flavor, we’d recommend you to only grind coffee beans the moment you’re going to use them, instead of grinding them and storing them away – that’s how the aroma is lost. Diameter and height can be directly connected with capacity since the height and size will determine the grinder’s capacity for how many beans it can hold. While some grinders only state their bean capacity, it’s still useful to know the diameter and height too. 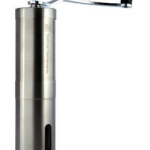 For example, Porlex Mini grinder has 47 mm diameter and 130 mm tall. Such dimensions can also be helpful to determine the compactness of the grinder, in case you don’t have a lot of space to keep it on your kitchen counter, yet decide to store it away. No matter how quality and good grinder is, if you don’t maintain it & clean it regularly, it won’t be as efficient as it used to be when it was brand new. Most modern grinders come with a quick & easy assembly feature where you can take the grinder apart and put it back together with no experience at all. This will allow you access to the inside which makes the cleaning effortless. Some of the grinders even come with a special cleaning brush that saves users even more time. 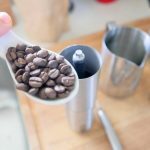 While most people are willing to spend more money on a coffee machine rather than on a grinder (which is as important), they usually go for lower-priced grinders. While there’s nothing wrong with that, you should still have in mind that investing now a few dollars more might benefit you more in a long run. And in fact, if you aren’t on a tight budget, you’ll be able to find a great grinder anywhere between $50-$100, while there are even some great models featured for about $30-$50. There isn’t much to know about the grinders, but also there’s nothing to worry about because you don’t need to be a coffee expert to choose your next grinder that will make your coffee way better. 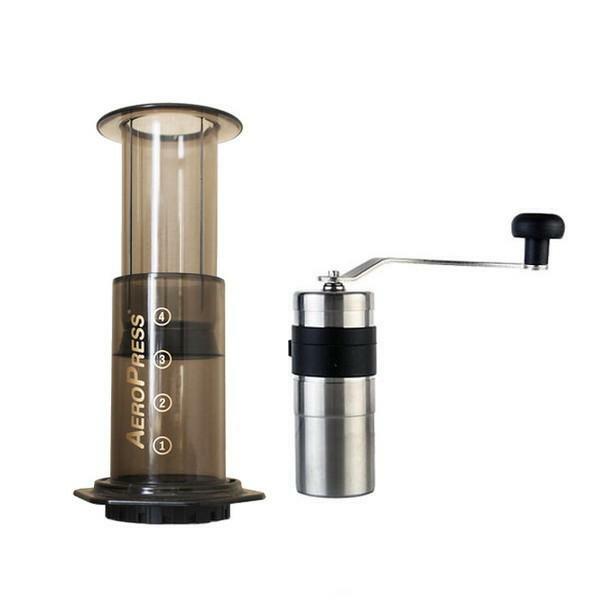 In fact, after reading this buyer’s guide, you’re ready to see some of the grinders suitable for Aeropress which we’ve tested, reviewed, and written about down below! The conical ceramic burrs grind in a range from fine to coarse. If you’re thinking in terms of coffee types, it’ll grind beans for Espresso or French press. The stainless steel body means you don’t have to worry about it banging into other equipment in your kitchen. 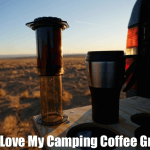 This also makes it a great travel grinder when you’re going camping or want to take it with you on a business trip. Travel is always better when you can bring your own coffee grinder. The Porlex Mini is a beautiful stainless steel, but has a silicon grip that will keep it from slipping through your fingers while grinding. This is important in a manual burr grinder. 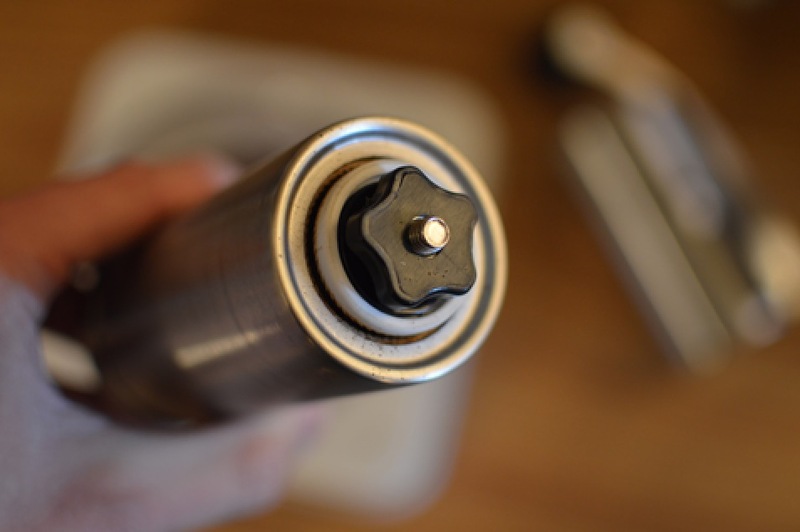 Users of the Porlex Mini report that they’re able to remove the bottom of the grinder and put the entire unit inside the Aeropress, which makes this incredibly convenient for Aeropress owners. They’ll be able to grind directly into the coffee maker. 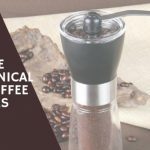 This isn’t for more than a cup or two of coffee, which makes it a great personal coffee grinder, but not convenient if you have guests or family who want coffee. 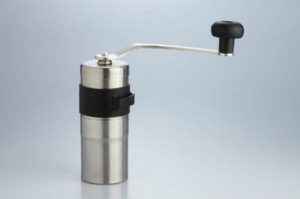 The BAIYEA hand coffee grinder allows you to adjust the settings for a variety of coffes from French press, pour over, Espresso, drip, percolator or Turkish. This makes it perfect for the Aeropress. 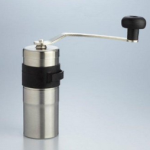 This is a stainless steel ceramic burr grinder that will stand up over repeated use. You can pack it in with your camping gear, take it on the train or a plane to your destination without worrying that it’ll be jostled in your bags. With all the settings enabling you to create grinds of any size, the BAIYEA also provides you with an ergonomic handle for producing finer grinds, which can take longer to do by hand. 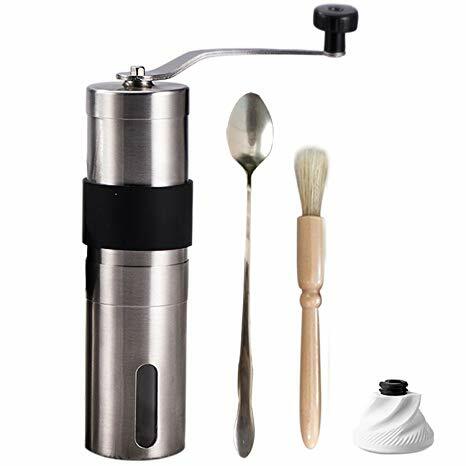 Comes with a measuring scoop and a cleaning brush to ensure your grinder is always in pristine condition for each grind. The unit has a small window to allow you to peek at the progress of the grind. There’s also room for a grind of 4 tablespoons, or the equivalent of 3-4 cups of coffee. This small grinder is perfect for smaller serving sizes, which might not be ideal for some people’s needs. The ceramic burr grinder is adjustable to create grinds from fine to coarse depending on the kind of coffee you want to enjoy that morning. The stainless steel of the Onyx manual coffee grinder means it’s corrosion resistant and lightweight for hand grinding. 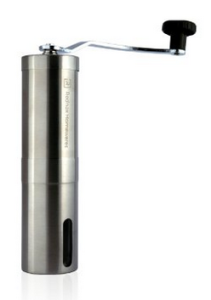 This manual grinder is easy to disassemble and reassemble for cleaning. Some dark roast beans are quite oily, which requires cleaning to keep the unit pristine for the next grind. It’s the perfect size for travel and can be packed in your luggage, hiking backpack or with your camping equipment. It’s durable for those locations, too. Some users don’t want any plastic in their grinders. This one has a small plastic peep window for viewing the grinds as they progress. 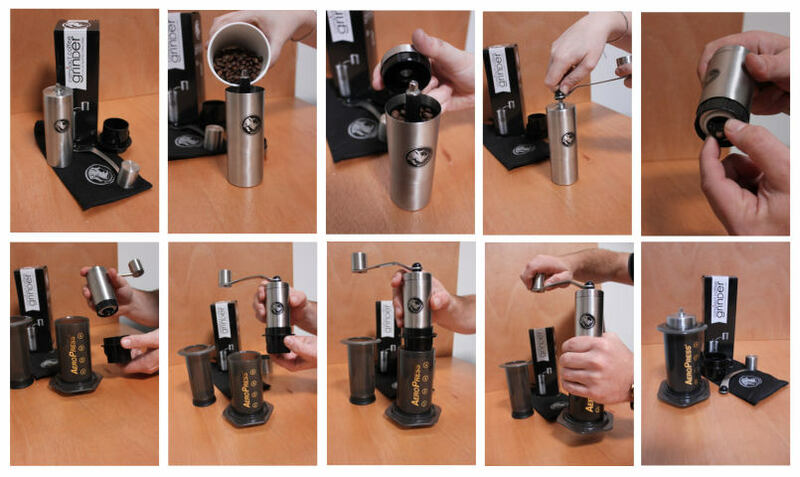 This grinder has 18 settings to give you the perfect grind for your coffee beans. Whether you want to an extra fine grind or a coarse one. Some people use this grinder for herbs and spices because it has such a broad range of grinds available. With a stainless steel body, this grinder will last for a very long time. You don’t want to beat on your grinder, but if it accidentally falls or gets banged around while traveling, it’ll stand up to the abuse. The grinder comes with accessories like a travel pouch, cleaning brush and scoop for the perfect amount of beans. The scoop has a clip to keep your bag of beans closed tight. The 18 click settings for a variety of grind sizes. This means you can try different coffees depending on your mood that day and be able to use the same grinder. 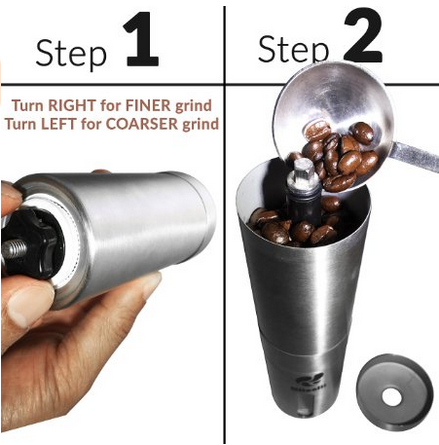 The only con we can think of for this grinder is the size of the container to hold the beans, but it should be expected that you can’t make an entire pot of coffee with this personal size grinder. Read our Q&A with Aeropress where we ask them every question we could think of to get the inside scoop! Unless I had a complete “airhead attack”, which is not uncommon; none of the grinders shown said anything about the grinder having ceramic AND steel burrs, which is what I put in the search box. Hmmm????? Chatting with the Fine Folks at Aeropress Inc. - Q & A Time!